The history of these two men is so closely related that it's impossible to tell the story of one without also telling the story of the other. Chauncey and John left their hometown of Cato, New York for the “west” when they were about 20 years old. Without family wealth or much education they became important to the development of Hillsdale. They arrived in Jonesville in 1834 with a stock of goods that they offered for sale. As the only “store” west of Tecumseh at the time, they had a guaranteed clientele. In 1836 Chauncey and John bought land where the current Fairgrounds now stand; there they erected a cabin. John became the first postmaster of Hillsdale, a tall desk in the cabin (now on display in the Fairgrounds Museum) serving as the first post office. Soon they established a grist mill, which they operated along with their new store, both in the area behind today’s St. Peter’s Lutheran Church. When the County Fair, which had bounced back and forth yearly between Hillsdale and Jonesville, was permanently established at Hillsdale, they sold their property to the county for a fairgrounds. There was a dearth of women in the wilderness of Michigan, and they needed to return to their home of Cato, New York for wives. John married Betsey Wolford and Chauncey married Julia Marie Smith. These brave girls left their comfortable homes to live with few amenities and the constant labor required to keep a home. Shortly after Julia died in 1841, Chauncey married Betsey’s sister Catherine Ann Wolford. Betsey and Catherine both died in 1850 and their collective five children were returned to Cato to live with their grandparents for two years. When John and Chauncey came to collect their children, they also wed again. John married Martha Wolford, the sister of his first and Chauncey’s second wives. One can only imagine how the Wolford parents felt about sending a third daughter to face the same privations and dangers that killed two of their daughters already. Chauncey married Phebe Elizabeth Hedges, who survived him. 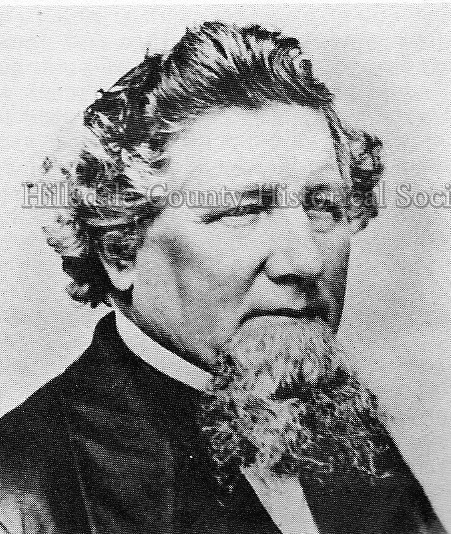 John and Chauncey are celebrated in Hillsdale County history and legend while their wives kept the home fires burning and produced a total of 24 children. In the late 1830s the federal government encouraged its citizens to settle the “west” and supported this with the laying of railroad lines. John and Chauncey were contractors for the building of the Southern Railroad. In 1846 they became stock owners of the newly named Michigan Southern Railroad. By this time, although still closely aligned in friendship and family, John and Chauncey had established retail businesses and banking ventures with different partners. Both men made a great deal of money—mostly from land sales and lumbering—and served their community in several political positions. Both men were deeply involved with the early Hillsdale College. The children of Chauncey Ferris didn’t remain in HIllsdale County, but those of John Cook did. This could account for the lack of detail on Chauncey’s life and the wealth of information we have about John’s, including some interesting trivia told with great affection by his descendants. As they prospered both men moved their families into impressive homes. Originally, they lived across the street from each other on North Street. Chauncey remained in his home behind the current Elks Lodge, surrounded by many acres. John acquired the current Delta Sigma Phi house, built in 1863. In addition to the first indoor bathtub in the county, it had a cupola. The family liked to go there to look toward the current State Road, where the soldiers of the 18th Michigan Infantry drilled for the Civil War on Lewis Emery’s farm. John loved his cows and to assure their comfort constructed a cow barn with a double row of bricks with air in between. Today the cow barn is a charming brick home at 81 River Street. At the Bicentennial of our country, 150 Years in the Hills and Dales included extensive information about John and his descendants, while Chauncey is only mentioned in connection to John. But Chauncey’s part in the fledgling county isn’t completely forgotten. Chauncey and John, good friends in life, remain connected in the town of Hillsdale, where the streets of Ferris and Cook meet at the now-abandoned mill behind St. Peter’s Lutheran Church.